1.Would not power up a device categorized as inductive loads with 40W rated power. As the reactive power of a device categorized as inductive loads with 40W rated power could be several times of its rated power to start. 2.Not compatible with Macbook Pro 15-inch. 3.If you have any question about the compatibility, please contact RAVPower customer support with the model of your device. 4.To turn ON the AC power supply, hold the power button for 8 seconds. The Type-C (5V/3A) and iSmart USB (5V/2.4A) ports allow for simultaneous and fast charge rates for your devices so you’ll have full power in no time. Housed in a portable cylindered design, the huge 20100mAh battery capacity can meet the charging needs of all devices – even the big ones. Once connected it can charge an iPhone 7 5.6 times, a Galaxy S8 3.7 times, or the 12” MacBook 1 time before the next recharge. 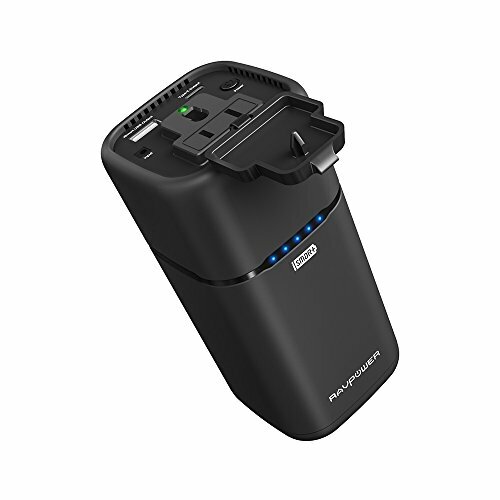 Taking only 4 hours, the 19V/1.6A DC input allows for faster recharging than almost any other portable charging device. The 5 LED indicators show the remaining battery level; while the power charger can be switched on or off by pressing and holding down the power button for 8 seconds.